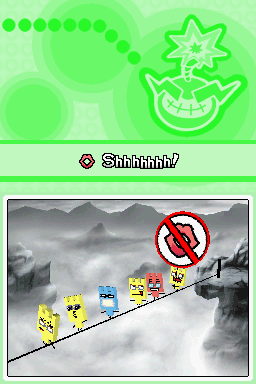 Tread Carefully first appears in WarioWare: Touched! as an unlisted and unnamed microgame that will randomly appear in Mic Rocking, Retro Action, Super Zero, and every other third level difficulty of any microphone games in the Album. It returns in WarioWare Gold as one of Fronk's microgames and has a chance of showing up whenever Ultra controls are hidden (such as in Wario Deluxe's stage) or every seven points for Mike's microgames in the Index. 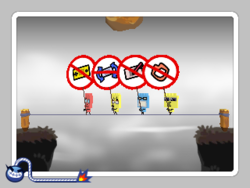 In WarioWare Touched!, the player must avoid blowing into the mic to save the Fronks from falling off a tightrope. In WarioWare Gold, the player must avoid interacting with the 3DS, including pressing any buttons, tilting the handheld, touching the screen, or blowing into the mic. However, in this version, sometimes the player has to save the Fronks from getting eaten by a monster by blowing into the microphone, causing the Fronks to be flown off the tongue of the monster and open up their parachutes. All three difficulty levels in both versions of this microgame are the same. This page was last edited on March 30, 2019, at 08:22.